Make no mistake, podcasting is getting to be a very serious business. 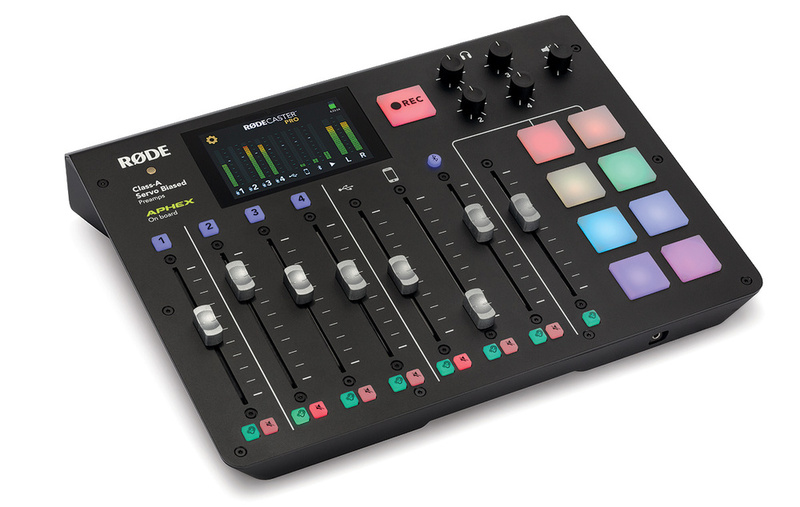 And for those who want to create radio show-style productions that include music, cues, jingles or sound effects as well as up to four miked voices, the RodeCaster Pro looks to be a very user-friendly and technically capable option. It incorporates on-board recording and playback facilities via a Micro SD card, and there are four microphone inputs with the provision of phantom power, plus further inputs for USB audio, a hardware music player or phone and Bluetooth audio. The RodeCaster Pro can also function as a two-channel, bi-directional audio interface. Each of the RodeCaster Pro's seven input sources is controlled by its own fader, with a separate fader to control the overall level of its eight playback pads. These allow for triggering sound effects, cues, music and so on, and the pads can be 'loaded' via direct recording or via a simple drag‑and‑drop routine when connected to your computer.